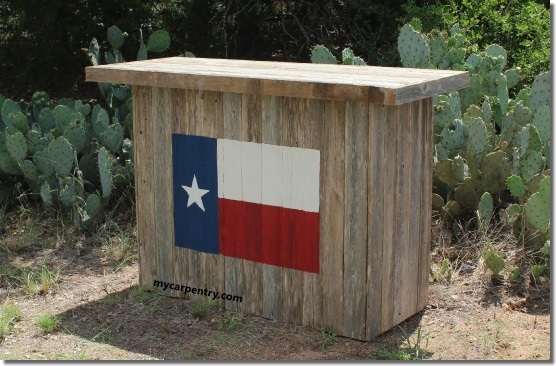 These rustic bar plans are easy to build and require only fence boards (new or used) and approximately five 8' pressure treated 2x2s (for framing). 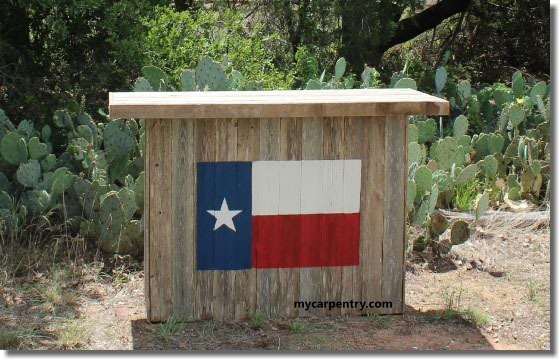 I used western red cedar fence boards for all of the other parts of these rustic bar plans, and fastened all of the pieces together using 16 gauge 2" galvanized finish nails. 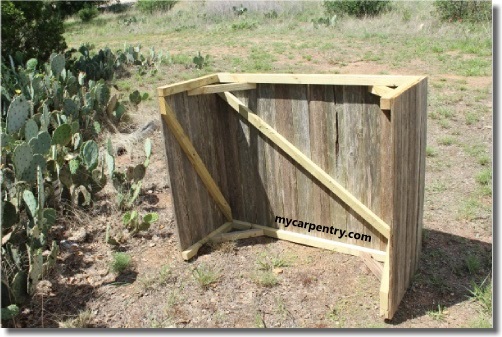 The number of fence boards that you will need depends on the width of the planks. The ones I used for my rustic bar were almost exactly 4" wide. I wanted to make the base of my bar approximately 48" wide (approximately 12 planks). To avoid having to rip one of the planks to make the base width exactly 48", I cut 12 of them, 39" long, and placed them side by side, then measured the width and cut my framing members (from the 2x2 pressure treated lumber) to match. I used the same procedure to determine the width of the side pieces. Five planks, approximately 4" wide, made the sides close to 20" wide. I cut the framing on the side pieces 2 1/4" less than the total width of each side, so that when the sides are attached to the front, you see nothing but 1x4 western red cedar (see diagrams above and assembled base below). The main goal of these rustic bar plans was to make the bar as light-weight as possible so that it could be easily transported. You can add more framing to the corners and even add shelves to the underside of the bar if you would like to customize it for your needs. 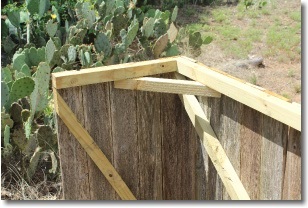 After you build the front and sides, assemble the sections with 3.5" galvanized wood screws. 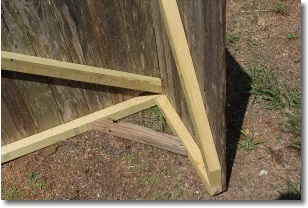 Brace the corners (square) with 4 2x2s approximately 20" long with 45 degree angles cut on each end. This will prevent the sides from swinging in and out. I used six planks so that the total depth of the rustic bar top would be about 24" and would overhang on the front about 4". I cut the six planks 60" long so that the bar top would overhang on each side (of the 48" base) about 6". The bar top is supported by 1x4s and 2x2s underneath and wrapped with 1x2 trim. With the trim added to the bar top, the outside measurements are approximately 25 1/2" x 61 1/2". The diagram above shows the underside of the bar top and a cross section (below it) so that you can see how the bar top is constructed. Once the bar top has been built, you can permanently attach it to the base, or just set it on top (unfastened) to make the bar easy to move. 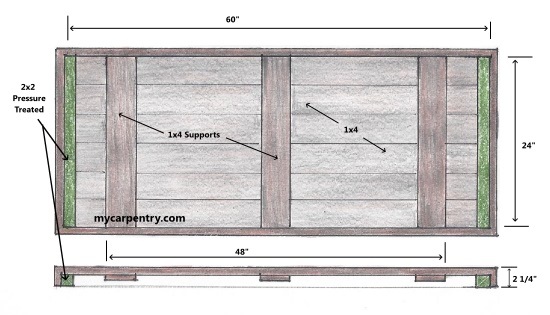 If you have any questions or suggestions about these rustic bar plans, please feel free to contact us. 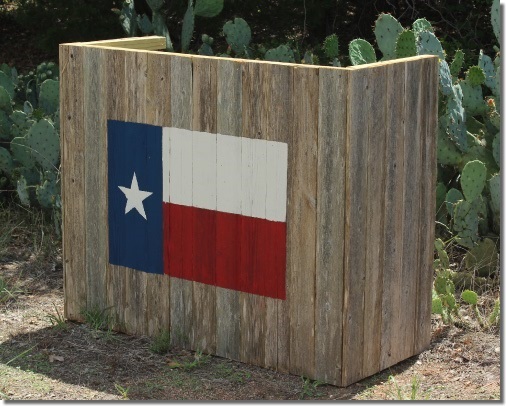 If you are interested in the dimensions of the Texas flag; the height is 20", the width is 30", the width of the blue section is 10" and the height of the white and red sections are 10". The diameter of the five-point star is 3/4 of the width of the blue section, making it 7.5".